Greytown New Zealand - WHERE IN THE WORLD IS GREYTOWN? Where in the World is Greytown? Watch the globe and travel from space to the Southern Pacific Islands of New Zealand, then to the lower North Island Wairarapa region. Greytown nestles in the South-Eastern corner of the Wairarapa Valley. As shown below. The Greytown region is famous for it's rich river silt soils. These soil conditions and temperate climate are ideal for the growth of some of the best fruit and vegetables around. Greytown - a popular weekend getaway, only one hour from downtown Wellington, fifteen minutes from Martinborough wine village, and miles away from city stress. 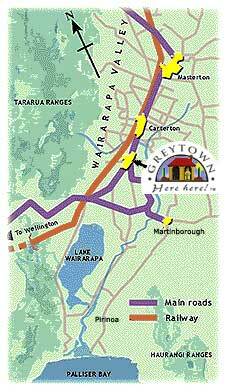 You can use this site to explore the area and to learn about Greytown's fascinating history, book accommodation and entertainment for your next visit the region. Enjoy your tour! Travel to Greytown by train from Wellington. A bus service is available to and from the Greytown station (located approx 5km from the town centre) on some but not all services. Getaway to Greytown; you will probably want to stay!